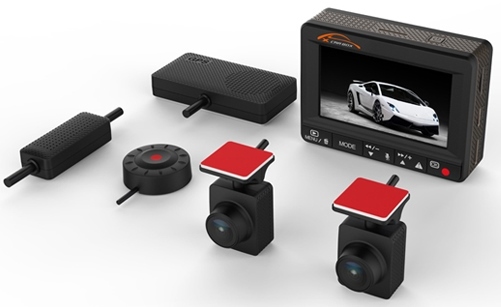 The K1S dashboard camera is manufactured by the Chinese company Koonlung. This is one of the first dual channel 1080p cameras that has the main DVR unit separate from the cameras. Most of the dual cameras released today often come with a very large front camera which is not a very discrete design. The K1S takes a different approach. They have 2 small cameras and a separate DVR unit that can be hidden elsewhere in the vehicle (i.e. locked in the glovebox). The Koonlung K1S has a 2.7″ touch screen and an optional external GPS. While the form factor of the K1S is excellent, there are a few drawbacks. Unlike many other expensive dual cameras, the K1S does not have pre-buffered parking mode. Also the camera uses a battery rather than a capacitor (many people prefer capacitor based cameras since they withstand extreme temperatures better than batteries). Some owners have indicated the audio quality is poor. It can be somewhat muffled and difficult to understand. There is no known resolution to this problem. The K1S records speed in kilometers per hour. There is no way of changing this to miles per hour at this time with the camera. However some dash cam viewer software allows the speed to be displayed in MPH. This GPSPlayerV1.9.zip has that feature. Some owners have indicated that the camera freezes. No known solution for this problem. One owner has indicated that the DVR unit reboots itself when the screen is touched or the wiring is moved. This could be due to a loose USB port. One owner has been able to squeeze the port to provide a better connection which resolved the issue. The Koonlung K1S is one of the first dual 1080p cameras with a separate DVR unit. Video quality, while not the best, is actually quite good. The form factor is excellent and you can lock away the DVR unit in your glove box. The camera does not have a lot of additional features like parking mode and WiFi but it does have GPS. Since this camera is relatively new, reliability is unknown yet but there have been a handful of negative reports (rebooting / freezing). Overall, this is the best discreet dual camera available on the market today and is a good buy if reliability is maintained. See what other owners have to say on our Koonlung forum. Final Word One of the first dual 1080p cameras with a separate control unit. Great design and good value. Missing some of the high end features (pre-buffered parking mode, WiFi).